Tej Pratap Yadav invites BJP MP Shatrughan Sinha to join RJD at Janta Darbar: Rebel BJP MP Shatrughan Sinha, who has been accusing the ruling party of diverting public attention ahead of the 2019 Lok Sabha elections by playing up the Ayodhya Ram temple issue, is facing criticism from several senior Bharatiya Janata Party leaders after he attended an anti-BJP rally in Kolkata organised by West Bengal Chief Minister Mamata Banerjee. 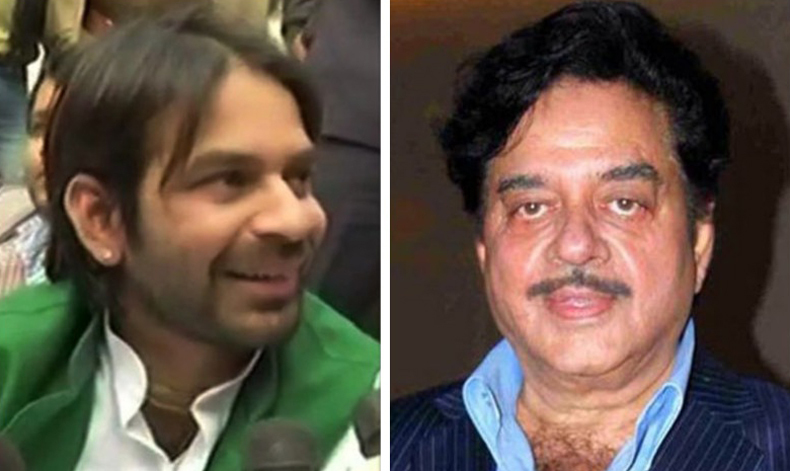 Rashtriya Janata Dal (RJD) leader Tej Pratap Yadav on Tuesday said he is still inviting rebel BJP MP Shatrughan Sinha to join RJD at Janta Darbar. On being questioned about on his statement ‘Sinha would be welcomed if he wanted to come to the party’, Yadav said he is in touch with him and he has also been to his place in Mumbai and inviting him (Sinha) to join RJD at Janta Darbar (Janta Darbar mein aa jaaein hamare). The Lalu Prasad Yadav-led RJD has opened its doors for Sinha at a time while the seat-sharing woes still haunt the Grand Alliance in Bihar ahead of the 2019 Lok Sabha Elections. Reports said Lalu Yadav is not ready to give more than eight seats to Congress but the Grand Old Party is bargaining for 12 seats in the state. The Congress has also expressed its resentment over Tejashwi Yadav’s meeting with Bahujan Samaj Party (BSP) supremo Mayawati in the aftermath of the BSP-SP alliance in Uttar Pradesh. The 72-year-old Lok Sabha MP from Patna Sahib, who has been accusing the ruling party of diverting public attention ahead of the 2019 Lok Sabha elections by playing up the Ayodhya Ram temple issue, is facing criticism from several senior leaders of the Bharatiya Janata Party (BJP) after he attended the anti-BJP rally in Kolkata organised by Trinamool Congress chief and West Bengal Chief Minister Mamata Banerjee. The BJP leaders are unhappy after Sinha attacked the ruling party over the Rafale deal at a mega rally organised by Mamata Banerjee-led TMC in Kolkata. Taking a veiled dig at BJP spokesman Rajiv Pratap Rudy, disgruntled BJP leader Shatrughan Sinha on Monday said Rudy shouldn’t wilt under pressure and keep his backbone straight. Sinha said he could only feel sympathy for the former union minister who has been under a lot of pressure because of being sidelined. Rudy had called Sinha very clever and opportunistic.